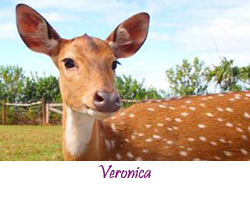 Home to goats, rabbits, donkeys, cats, peahens, pigs, ducks, deer and chickens, Leilani Farm Sanctuary is located on a lush 8-acre farm in Haiku, Maui. It is an all-volunteer, non-profit organization created to provide shelter and care for abused animals, and humane education to the community. Our goal is to awaken the compassion in every visitor. 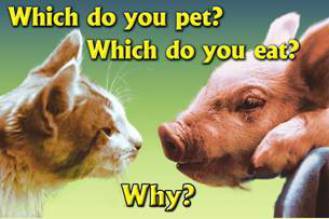 Connecting with disarmingly happy animals acting in ways one doesn't expect farm animals to act, people are inspired to take the next step toward a cruelty-free lifestyle by adopting a diet free of animals. 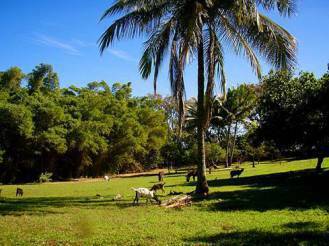 Leilani Farm Sanctuary is a paradise for animals. It's a paradise for humans, as well! On the outer, most visible level, LFS lives and breathes upon a unique piece of rolling land, eight volcanic acres on a green Pacific island. But its superb location and jaw-dropping natural beauty are but reflections of its lush inner essence. The sanctuary is a refuge for animals, a safe haven for those fortunate enough to have found their way here. Among them are many farm animals whose cousins live dismal lives on factory farms and are routinely slaughtered by the billions to satisfy the palates of those who still choose to be meat eaters. In stark contrast, the rescued individuals at LFS, some of them looked upon by the world at large as "food animals," are without a doubt among the most fortunate beings living on Planet Earth. Each rescued animal has his or her story. 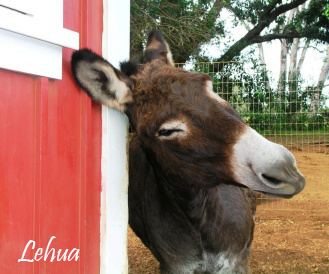 Lehua, the donkey, had lived her life under the dark crawl space of a house, unable to graze and completely isolated from other animals. Larry, our elder La Mancha goat, had been kept on a short tether, lacking the company of other goats for the first ten years of his life. Another goat was spared the butcher's knife through a near-miraculous change of heart by a worker at a meat ranch. Some of the sanctuary's young residents, including one very endearing deer and several goats were orphaned when hunters shot their mothers. Others, such as rabbits and chickens, had been given to children as holiday presents, then later discarded when they became too cumbersome to care for. Some of the roosters were liberated from cockfighting compounds. (We continue to work actively to put an end to this cruel, inhumane practice that passes in some cultures as "sport."). The sanctuary is an idyllic meld where many droll surprises are seen: a piglet bonds and plays with pug dogs the same size as she, a rooster "falls in love" with a goat and takes rides on her back, a young goat befriends a donkey. Cats live peacefully among chickens, stretching out on their backs in the warmth of the sun; peahens find safety on the shaded veranda and, honking like Model-T Fords, they fan their feathers and strut their stuff; rabbits become obsessed with tunnel-digging, their paws scratching the earth in accelerated motion, red dirt flying everywhere. In fact, all the animals at LFS have unique personalities that showcase their individual characters. Here at the farm sanctuary, the operative word is "community." Animals live in harmony with each other, as their deeply-ingrained cooperative ethic, based on survival, shapes their world-and informs ours, too. 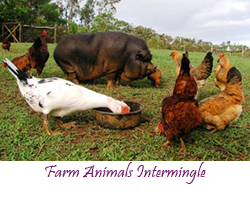 Leilani Farm Sanctuary provides a healthy, happy home for all these animals. It offers caring humans an opportunity to engage them in a natural setting where they're all loved, and where all their basic needs are attended to. 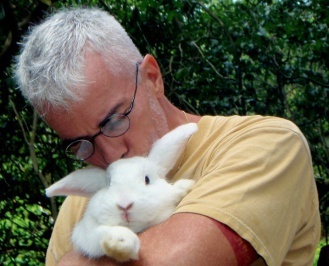 Many visitors who have come here to meet the animals have been touched, each in his or her special way, by the "humanity" of these amazing and lovable beings. They've had a sample of compassion-in-action and have glimpsed the real possibility that all living beings might be treated with deep caring and respect. These human-animal encounters have proved over and again to be nothing less than genuine healing--on both sides of the equation. All are enriched by the love that is shared here. Our hope is that Leilani Farm Sanctuary will continue to serve as an ever-widening beacon of love and light for our ailing planet. We envision a world in which people everywhere have an abundance of good food to eat and without sacrificing the lives of innocent animals, in the process. We consider adopting a vegan diet, as one key aspect of living lightly on the earth, the best path to realizing that dream. May we all thrive, in peace and in a spirit of oneness! And may we always act responsibly, in ways that will benefit all sentient beings. 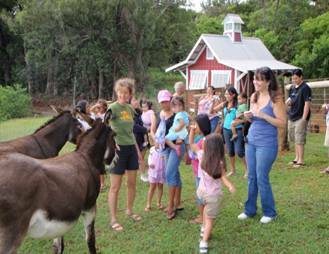 Leilani Farm Sanctuary is an educational facility that teaches children and adults about animals in a way that changes their perspective about themselves and the world around them. Our emphasis is upon teaching that every living being needs food, water, shelter, shade, love, and has language. We host at-risk youth programs, school field trips, special needs children, elder activities, and farm tours for the general public, including visitors from the Mainland -- providing our community with a hands-on experience that is thought-provoking and stimulates social and emotional growth. 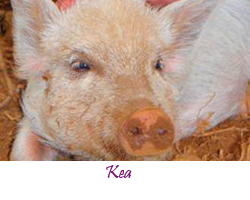 Exploring with children how abused animals have learned to forgive and overcome their pasts, the animals become role models, helping the children deal with their pain and reach for their bright futures. By learning empathy and respect for all life, children become protectors rather than abusers. Animals, with their unconditional love and non-judgmental attitude, can often reach kids more deeply and effectively than people can. 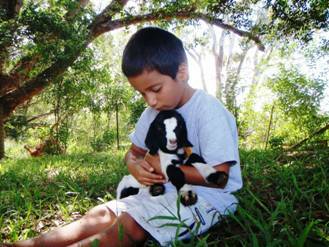 The healing that takes place when children get together with the animals is profound. (Only up to the most recent newsletters are displayed. 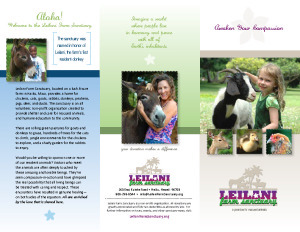 For past issues, email info@leilanifarmsanctuary.org directly).